There are two types of people: one longs to see the world while the other is content to stay put, never desiring to venture more than a few miles away from home. While I am convinced of the veracity of this statement, I have long wondered why it is true. I, for one, fall into the former category, likely as a result of moving a great distance from my native land as a young child. I have wanderlust. Actually, as I've said before, it would be more accurate to call it hungerlust [noun: a very strong or irresistible impulse to consume foods in faraway places]. Food has always been my window into other cultures. Hungerlust is a hard itch to scratch. For all of the worldly reasons you would expect, opportunities to travel are precious few. And then, when finally there is a trip, the itch returns almost as soon as you do. It's been exactly a year since our trip to Venice, Bologna, and Paris, and my hungerlust is flaring up again. The yearning to travel occupies my every waking moment. I dream of seeing new and exotic lands. And I ache to revisit all of the places I've already been, because I fell in love with each and every one of them when I first went. It's like feeling homesick, only for places that have never been home. Travelers often collect souvenirs as reminders of their various journeys. Some bring home arts and crafts and some fashion, I bring home recipes. It's my way of keeping a little piece of my destination with me forever. For recreating the smells and tastes of a place at home is the next best thing to actually being there. This helped ease the hungerlust for a little while. It'll transport you to Bologna, if only for one meal. Heat a large, heavy pot over high heat until very hot but not smoking. Add the oil and swirl to coat the bottom of the pot. Add half of the beef and cook for 7 to 8 minutes, tossing about 2 times, until crusty and brown in spots. * Using a slotted spoon, remove the beef to a plate. Sear the remaining beef in the same manner and set aside. Reduce the heat to medium, add the pancetta to the pot, and fry, tossing frequently, for 3 to 4 minutes, or until golden brown. Add the onion and sauté for 5 to 6 minutes, or until soft. Add the celery and carrot and sauté for another 5 to 6 minutes, or until soft. Add the garlic and tomato paste and sauté 2 to 3 minutes more, or until fragrant. Add the wine and simmer for a minute or so, scraping up the brown bits from the bottom of the pan with a heat-proof spatula. Return the beef to the pot and add the milk in thirds, simmering for 2 to 3 minutes, or until nearly dry, after each addition. Add the tomatoes, broth, bay leaf, nutmeg, and a generous pinch of pepper. Bring to a boil and simmer for about 3 hours, or until thickened and saucy and the flavors come together. Discard the bay leaf and season to taste with salt and pepper. Makes enough for 10 to 12 portions of Fresh Egg Pasta. Traditionally, this sort of sauce is made with diced beef. A great shortcut to all that dicing is chili grind, which is very coarsely ground. 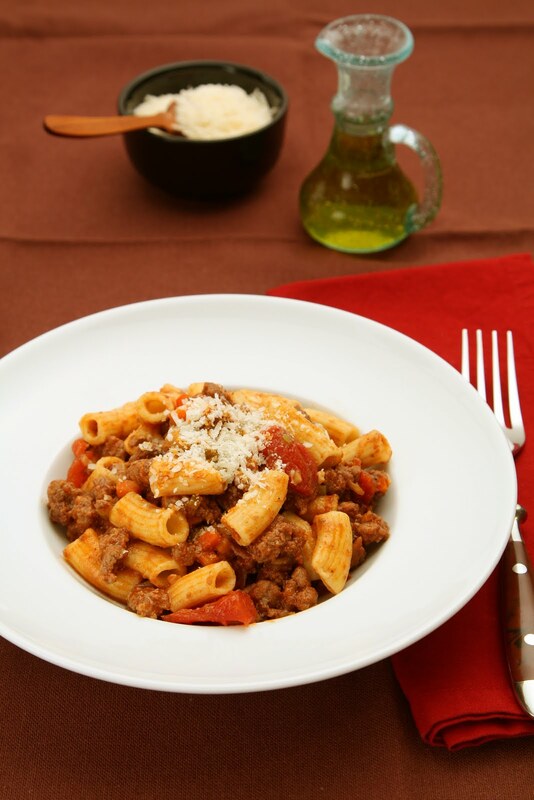 Toss al dente pasta with the ragu, top with plenty of grated Parmegiano-Reggiano, and serve immediately. This time, I topped homemade extruded macaroni (made with 10 ounces all-purpose flour and 3 large eggs) with my ragu. *Searing the beef in this manner adds tons of flavor to the finished dish. For everything you ever wanted to know about searing, plus dozens of fabulous searing recipes, look for my book Seared to Perfection in stores now. Hello! Thank you for the recipe! The use of milk though is controversial...many of us don't use it and simply put tomatoes and meat (and "battuto" of celery, onion, garlic and carrots). Despite having never really gone anywhere as a kid, I have a HUGE appetite for travel. I solved my wanderlust problem by now taking people to Italy about once a year - next trip this fall if you want to go! And as much as I've traveled around Italy and Europe, I've never been to Bologna, but know I must someday soon!